Cayin is one brand name of Zuhai Spark, a Chinese hi-fi specialist operation. Its amps are all valve-based designs running the gamut from relatively pedestrian valves, like the KT88 and EL34, to the exotic-looking GU29. The Cayin A55-T is one of the most comfortingly traditional models in the range, using a familiar line-up of four KT88 valves, plus two each of the ECC82 and ECC83. Like many current pentode/tetrode amps, this one has a choice of operational modes: ultralinear or triode. Rather classily, these are selected via the remote control (a front-panel switch would have been useful). The choice of mode gives flexibility in the matter of output power, with 40 watts on offer in ultralinear mode, but only 18 watts in triode mode. But what may be of more significance to most listeners is that it invariably slightly alters the basic sound, due to the different impedances and distortion signatures involved. The layout of this model is classic, with transformers behind and valves neatly displayed in front. Inside the chassis, connection is a mixture of small printed-circuit boards and neatly executed wiring (with quite a few boutique components), plus generous power-supply capacitance and a smoothing choke. Inputs are switched by relays and the volume control is a motorised ALPS 'blue velvet' component. Auditioning this amp in triode mode, our 'blind' listeners were generally very taken with its presentation. It's particularly good with voices and that, of course, is a big plus with any hi-fi kit. In similar vein, it communicates melodic lines well and one is always clearly aware of the tune when listening – as one listener succinctly put it, 'musical!'. But there's more to this amp than just sounding vaguely nice. 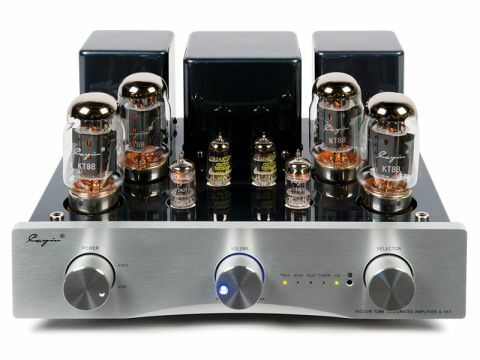 It has good detail across the midrange and into the treble and presents very good images, too, with clearly defined lateral placement and stable, plausible depth; you could say this amp makes the direction and focus of a piece of music very clear. There's something of a down side in the handling of frequency extremes, although it didn't greatly trouble our listeners. Bass is a little lacking in real extension and although it is reasonably tight and rhythmic, it doesn't pack quite the punch that one or two other amps managed. Treble is just slightly on the dull side of sweet, but it's clear from our listeners' notes (and our own subsequent sighted listening) that this is something one gets used to in a couple of minutes and not a serious distraction. Dynamics are interesting, seeming somehow to make the shift from quiet to loud rather rapid, though the reverse direction is natural enough. This seemed less noticeable in ultralinear mode, which also gave rather more kick to the bass – but the mellifluous quality in the midband suffered slightly and, on the whole, we preferred triode mode.